You can thread a needle, but some of the basics of your machine elude you. Brenda Truax is an expert seamstress with nearly 50 (!) years' experience. 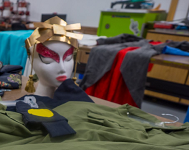 Her skills range from simple techniques, tailoring, designing, creating costumes, and transforming an existing garment into something new. She offers a relaxed atmosphere and gets excited when people want to learn new things.